The mid-sized drones can perform almost all stunts and are available at affordable prices. That's why they are considered to be an intermediate step to professional drones. Syma has one of the strongest presences in the affordable quad’s market and Syma X8W is one of their best product and also the company’s biggest model to date. 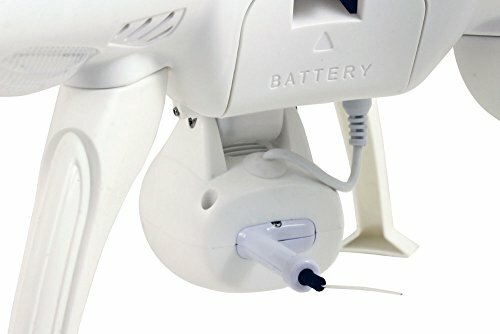 It is probably one of the best mid-range drones and it offers great value for money, costing less than $100 (this articles covers more drones that cost less than 100 bucks). 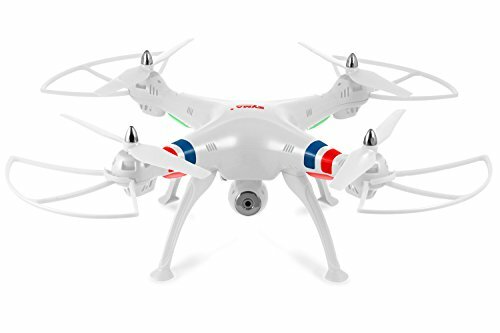 The mid-sized drones can perform almost all stunts and are available at affordable prices. That’s why they are considered to be an intermediate step to professional drones. The Syma X8W utilizes a combination of a mobile device and a separate remote controller to control its flight. This means that if you want to take advantage of this advanced combination you’ll have to download the mobile application. 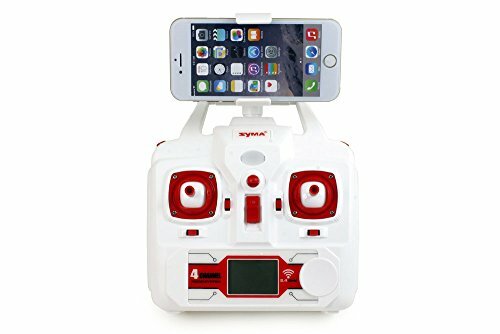 The package includes Syma X8W Quadcopter, transmitter, Wi-Fi Camera, Li-On battery, USB charging cable, 8 rotating blades, 4 landing gears, 4 protection frames, phone holder, screwdriver and instruction manual. The Syma X8W is above average in size, with a wingspan of 340mm. With a weight of 383 grams, this drone is above average in weight. It is equipped with bright LED lights for night flights. Syma X8W is still far away from being one of the heaviest drones out there but – these drones are good in heavy lifting and have high carry capacity. 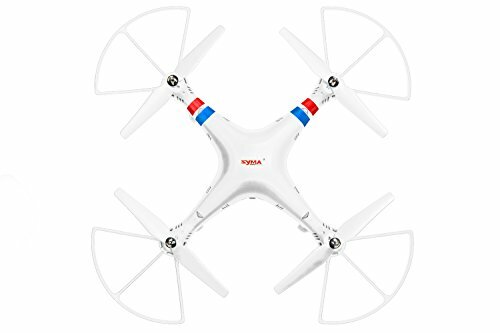 The drone is made of plastic and has a decent build quality. The main goal of the designers from Syma Toys was to make a nice looking and simple to fly drone. 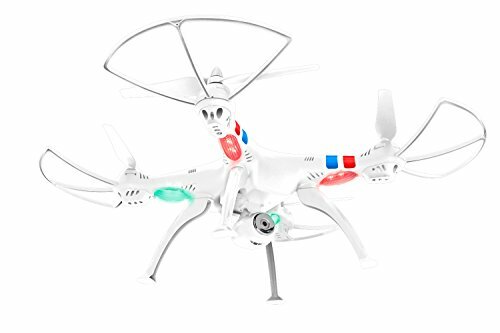 The X8W comes with 6.axis gyro stabilization system and it is designed to be easy enough for the average consumer. It is considered to be one of the most reliable low-cost FPV drones currently available in the market. Also, it is important to note that the drone is able to carry about 80 grams in addition to the weight of its built-in components. As far as the color goes, the drone is available in orange, black and white. The great thing about the X8W’s transmitter is that it is unusually large. The RC’s battery compartment is designed for 6 AA batteries. However, it requires only four AA batteries for functioning. The transmitter comes with a clip that allows you to attach your Smartphone on top of it. You can operate your quad about 100 meters away from you. The main reason of X8W’s affordability is not using a FPV monitor for the real time video transmission. If you are a big fan of drones that can automatically follow you – make sure to take a peak at this article. Instead, this drone combines the features of a separate remote control with the visual appeal and ease-of-use of a Smartphone. The X8W is best operated when using the two in combination. That’s why Syma has smartly developed an application for both Smartphone and tablet with iOS or Android that can be downloaded for free onto your compatible mobile device. The application connects to your phone and allows you to watch what the drone is watching directly on the phone screen. The image is clear and not interrupted. However, depending on the obstacles on the area you flying in, it may have one second delay. This connection is done through Wi-Fi. 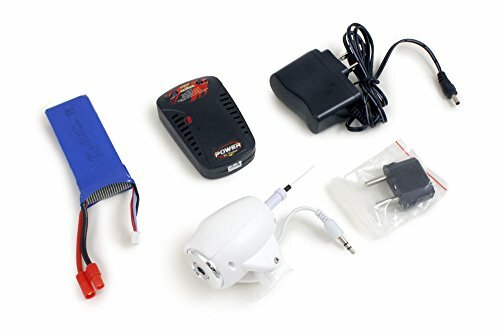 The X8W is powered with a 7.4V 2000mAh Li-Po battery that allows about 8 to 10 minutes of continuous flight. The strange thing about X8W’s flight time is that the flight time remains very much the same with or without its camera. This is not impressive flight time – but this article covers drones that will impress you as these drones have good batteries and battery life. The battery takes about 200 minutes to charge completely. It is very important to note that for optimal functionality and longer life, Li-Po batteries with multiple cells must be charged with balance chargers. Also, it is recommended to buy a second spare battery because a full charge may take about 200 minutes. The MP of resolution that the X8W has is not exactly the best quality available. 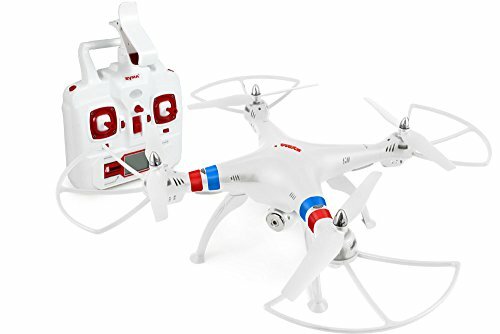 However, the image quality from this camera is decent enough for a $100 toy-grade drone and it is meant for newbies who want an inexpensive introduction to the world of FPV (these are great FPV drones for beginners). Have a look at other awesome best racing drones. On the other hand, the X8W is not an aerial photography platform that you’d use for a professional video production. 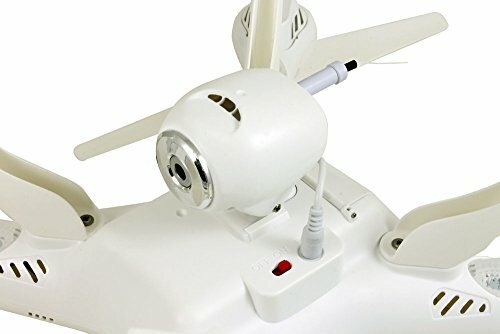 The camera has the approximate size of a walnut and you have to install the Syma FPV application in order to connect your Smartphone to the Wi-Fi camera for FPV flight. An amazing feature of this quad that allows to perform 360 degree flip is called “3D Eversion”. This feature is activated by pressing the right shoulder button. The X8W also features headless mode, for easier flight regardless of quad’s position. This mode is activated by long pressing the left shoulder button. It is also important to note that this is not a racing drone so it will not break any speed records. It is more famous about the stable flight. This feature is absolutely necessary for aerial filming. The X8W’s’s weight and size help it fly better in windy conditions than a lot of smaller and lighter quads. The Syma X8W is designed for novices who are keen to experience FPV flying on a tight budget. It is a great product from a very reliable manufacturer. The X8W an amazing beginner quad for aerial photography and it also makes a nice trainer quad. 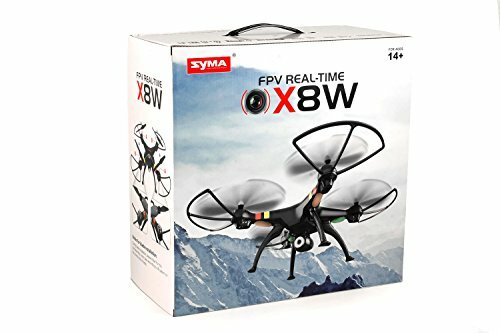 If you want to experience FPV flying but are not willing to spend a lot of money on an expensive FPV quad, the Syma X8W is an excellent choice for you.